Preparing a big dinner for a large group and making soft and fluffy dinner rolls that emerge fresh from the oven and into the bread basket at the same time is a big challenge. Sometimes it's just easier to make a big loaf of bread that can be made a day in advance to slice and serve. Still, there is something about soft dinner rolls warm from the oven, split open, and buttered or dipped in gravy. 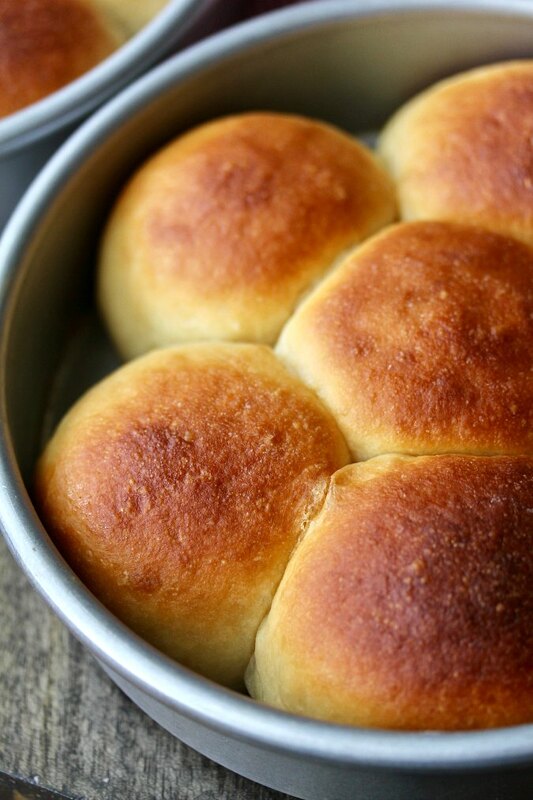 These dinner rolls are great straight from the oven, but they also make wonderful leftovers. There is so much bake-ahead or bake-at-the-last-minute flexibility in this recipe. For example, you can freeze the shaped rolls to bake later. 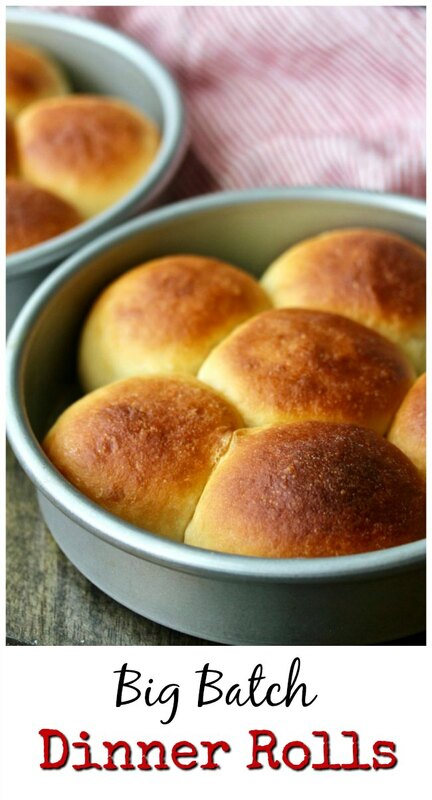 You can also place the shaped rolls in the refrigerator for a few hours and bake them when you are ready. 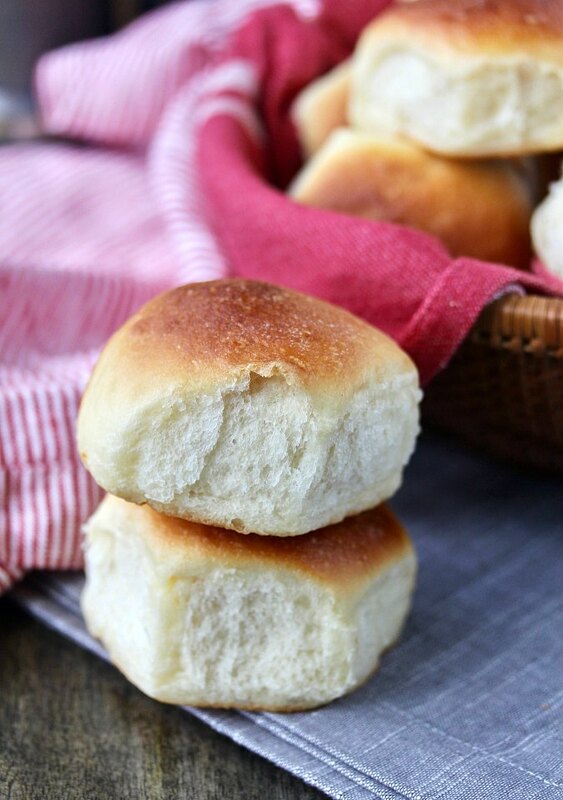 In fact, you can do all three with these rolls... bake one batch right away, bake some the next day from the refrigerator, and bake the last batch from the freezer a few weeks later. 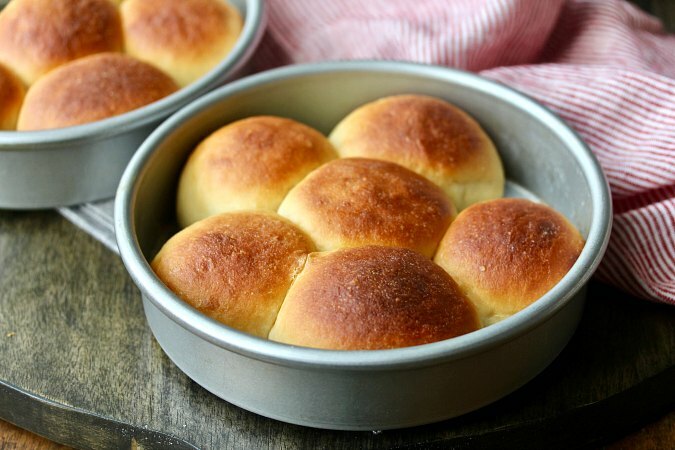 How do you make these dinner rolls in advance? To make these dinner rolls in advance, shape the dough into rolls, place them into pans, cover with plastic wrap, and freeze the rolls. If you want to make these rolls a few hours in advance, place the shaped and wrapped rolls in the refrigerator for about two to four hours. Once you've baked your main course, pop the rolls in the oven to bake while your turkey, casserole, roast, or whatever your main dish is sets up. There's a lot of yeast in this dough, which makes them fast rising. Your bowl of dough will actually feel warm. P.S. Leftovers will be good saved in a plastic bag for up to 3 days. 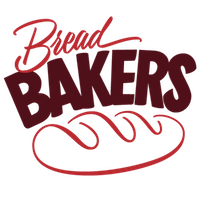 This month, we are catching up on old ‘Bread Bakers’ themes we missed out on. Our host of the month is Pavani at Cook's Hideout. I decided to revisit the theme "Family Feast." Check out what the Bread Bakers have baked up. Stir together the water, milk, butter, sugar, salt, and yeast in the bowl of a stand mixer and let the ingredients rest for about 10 minute. Add 3 cups of the flour to the bowl and mix with the dough hook for about 3 minutes. Add more flour, 1/4 cup at a time, mixing each time until well incorporated, until you get a cohesive dough that is tacky but not sticky. Knead for another 5 minutes. Cover the bowl and let the dough rise for 20 minutes. Remove the dough from the bowl, flatten it, and cut it into 24 equal pieces. Place the balls into greased pans - Either 1 half sheet pan, 2 quarter sheet pans, or 4 round cake pans. Cover with oiled plastic wrap and let rise for 20 to 25 minutes. Heat the oven to 350 degrees F. Bake the rolls for 20 to 25 minutes until the rolls reach an internal temperature of 190 degrees F.
To make ahead, let the shaped rolls rise for 10 minutes, cover, and then freeze up to 4 weeks. Thaw the frozen rolls in the refrigerator overnight, unwrap, and bake as instructed. I would love to open my freezer and find a bag of these beautiful little gems! Your photos are always so pretty. I like that you can shape these ahead of time. I struggled with that at Christmas. I wanted the rolls to be hot from the oven but I had so many other things to work on as well. These rolls are perfect for that! Wow, those dinner rolls look just perfect -- crisp golden crust and fluffy soft inside. Love that they are so accommodating and can be made ahead of time or at the last minute. Absolutely perfect Karen..Great rise, golden brown and you can see how tender they are. Thanks Wendy. They really were! These look so soft and fluffy - Yes please with a bowl of soup! I bake my buns the day ahead, remove them from their baking pans, but keep the buns clustered together rather than separated into individual buns. Then I put the whole cluster of buns right on the rack of a 350F oven for 8 to 190 minutes and they come out like freshly baked...warm with a bit of a crisp crust. I do that for a loaf of bread too...ust migt warm it in the oven a minute or two longer. I meant to say the day of serving, I refresh the buns in a 350F oven for about 10 minutes. Gorgeous as always, Karen. I'm sure your family would be delighted with whatever you bake! You always bake the most amazing breads! 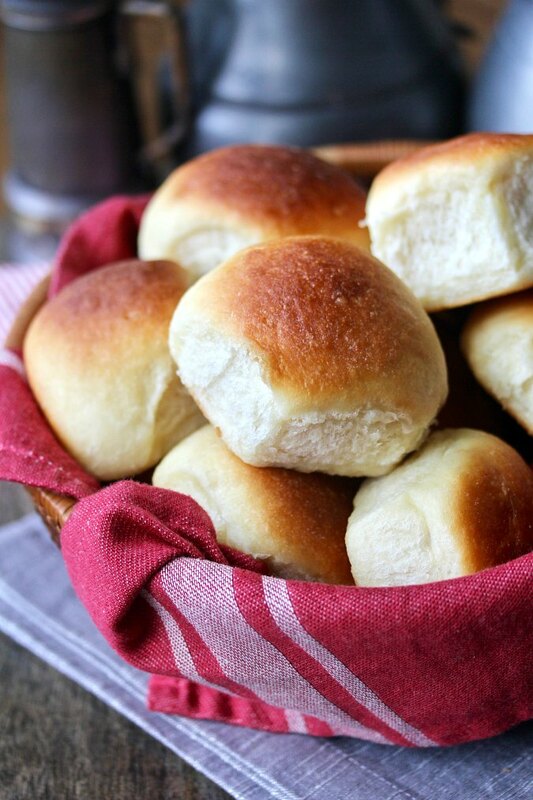 These rolls are gorgeous! Hello Karen, your dinner rolls look so soft and fluffy. The crumb is so light and airy. I am sure that everyone must have loved them.